I met the real life Hal Jordan & Barry Allen! Tonight I was lucky enough to meet some genuine, real life heroes! On 14 October 2012, Felix Baumgartner flew approximately 24 miles into the stratosphere in a helium balloon before free falling then parachuting to Earth. While falling Baumgartner became the first person to break the sound barrier, becoming the Fastest Man Alive! Truly, a real life version of Barry Allen, The Flash! Baumgartner also broke the record for the highest altitude jump. This record was originally set by Baumgartner's mentor, retired USAF Colonel Joseph Kittinger, who also jumped from a helium ballon, in 1960! Kittinger is a fearless test pilot who is basically a real life version of Hal Jordan, Green Lantern! Very cool people! It was an honour to meet them. 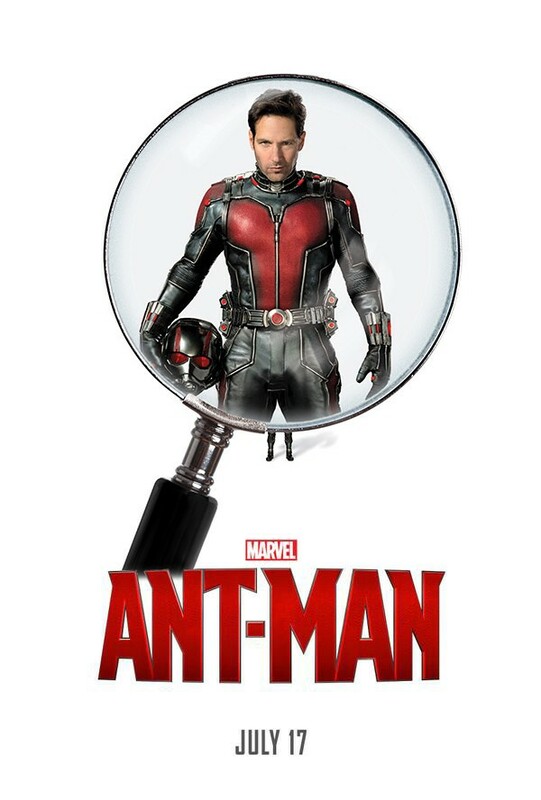 Ant-Man is a fun film that I intend to rewatch a lot in the future. Having said that, there was something missing in the film for me. It's difficult to say this without sounding like I'm doing some tired 'small' joke, just like every other reviewer of this film, but Ant-Man is a lot more lightweight than the other Marvel films. I came out feeling like I'd just watched a particularly good TV pilot rather than a great movie. At first it was difficult to put my finger on what was missing from Ant-Man. I thought at first that it might be Paul Rudd's performance. It felt like he was going for Robert Downey Jr's laid back attitude but ended up coming across as flat and unengaging. Then I thought it might be the charmless, dull, bog-standard villain, played by that bald bloke out House of Cards. But let's be honest, there have been other Marvel films that have suffered from weak villains (Guardians of the Galaxy being the latest) and that usually doesn't spoil the film too much. Then it hit me. Ant-Man really feels like the ghost of an Edgar Wright script. Ant-Man was originally to have been scripted by Edgar Wright and Joe Cornish, and directed by Wright. Somewhere along the line Rudd apparently rewrote the script with the new director, Peyton Reed. I must emphasise at this point that I had honestly forgotten all about this when I entered the cinema and while I'm a fan of Wright's work, I didn't enter the film with any prejudices about "the film we could have had". Despite this however, lines and scenes that should have been hilarious raised only a smile or a brief laugh. To me, these scenes felt like they'd been conceived by Wright but executed without his pace or wit. If you gave a Spaced script to a director who was unfamiliar with Wright's humour and timing I imagine you'd get a similar result. This certainly isn't true of every scene. There's a lot that works. The ending, while predictable, is beautifully executed. Michael Douglas is fantastic, a joy to watch in every scene he's in. He's helped by the fact that Hank Pym's backstory and the way it fits into the larger Marvel Cinematic Universe is one of the most interesting parts of the film. Evangeline Lilly is for the most part great, but unfortunately has very little chemistry with Rudd. Ant Man's not the strongest Marvel film ever, but it's still very entertaining. And come on! Edgar Wright or no Edgar Wright, bloody Ant-Man just made $58 million in its opening weekend! Ant-Man! That's awesome!!! Truly we are living in a golden age of cinema! Phase Two of the Marvel Cinematic Universe is over, and so here is my ranking of every Marvel film so far from favourite to least favourite (although I must emphasise, I love them all). Feel free to shout at me in the comments. When I was a kid the Hanna-Barbera Fantastic Four cartoon was on at six on a Saturday morning. I didn't have an alarm clock so I made myself get up really early and then just watched Ceefax until it came on. Needless to say I can't wait for Josh Trank's Fantastic Four, so I made this. Doctor Who: Is Maisie Williams Playing Susan? The BBC have released the trailer for Doctor Who Series 9! It's already set me (and countless other fans) off on wild flights of fancy, trying to figure out what the series has in store for us. The biggest question posed by the trailer is, just who is Maisie Williams playing? The Doctor seems to know her and she seems to know him. They seem to have not seen each other for some time ("What took you so long, old man?"). Could this be The Doctor's granddaughter, Susan? If this is the case, this is pretty huge! As we saw in The Name of the Doctor (2013) Susan escaped from Gallifrey with her grandfather, The Doctor back when he first nicked his TARDIS. She was with him right at the start! Apart from The Name of The Doctor (where we only see the back of her head) she hasn't been seen properly in the TV series since she was abandoned by The First Doctor in future London following The Dalek Invasion of Earth (1964). Well, technically she turned up in The Five Doctors during the '80s, but she didn't really do much except fall over for no reason, so that doesn't count. 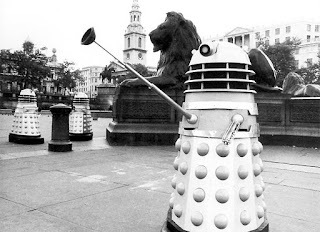 The Dalek is blurry but what we can see of him looks very much like the Daleks seen in Dalek Invasion of Earth, Susan's last appearance! Am I right? Probably not. After all, my Missy theory was way off. But it's fun to speculate. Can't wait for the 19th of September!